Could it be? Could it be? Could it be Z? Coming up with stories for this blog is so simple. I never really have to "think" about what I'm going to write. Topics pop up like weeds, and then I work my magic on them. Today I was catching a smoke outside of one of my coffee shop FREE WiFi hangouts. A guy pulls up in a big car. What struck me was his beard. I approached him and asked to take his picture. And that is the genesis of how I met half of ZZ Top and the ghost of Roy Orbison. I asked the stranger after he emerged from the car, "How long have you been growing that beard?" He said, one year and two months. I asked him why he was growing it. He said, "They're coming back." After a chuckle, he walked two doors down and into an antique shop. All I kept thinking was, "I have GOT to get a picture of this guy. He looks like Z of ZZ Top." I don't know where the other Z was, but I had a Z right here and he was on the top of my mind. I grabbed my camera from the coffee shop and hurried over to the antique store. There was Z, chatting with the lonely owner - an elderly man that didn't have an ounce of fat on him. After nodding to the owner, I approached Z and said, "I hope you don't think I'm a pest, but I have to get a picture of you and your beard." "Whatever floats your boat. But it will cost you a coffee." "I can swing that. But, tell me, is there a story behind the beard?" "No. But you know Moses, the guy that went up the mountain and got the Ten Commandments from God. Well, I was with him." A guy with his beard and long gray hair looked like a lot of Vietnam Vets that I see around town. "Were you in Vietnam?" I could see that he wasn't much of a conversationalist. But I had my subject, $2.00 for a coffee and I wanted a picture. Z had taken off his sunglasses in the antique store. I told him, "You gotta wear the glasses." At that point, he pulled a small, black, plastic comb out of his back pocket and started combing his hair and beard. He took pride in his growth and he wanted to be ready for the picture. Without further words, we stepped outside and found a spot for him to stand. He stood real straight and stared at me. No smile. Just staring. Who knows what his pale blue eyes were doing behind the giant shades. SNAP. And it was coffee time. I didn't even want to try and go for a second shot. I felt I was on borrowed time with Z. We walked into the coffee shop and I told the girl behind the counter to get him whatever he wants. A small coffee with four sugars and a gallon of cream was his order. It was a small cup for a large order. I think the cream had a hint of coffee in it. Suddenly, he wanted to talk. He told me his name was Dave, but everyone called him Homer. "Damn, I thought it was Z." Glad I found out he wasn't Z before I made a fool of myself and started asking for the whereabouts of the other Z and when they were going on tour. I almost asked him to sing "La Grange," but that seemed like pushing it. Homer started telling me about a song he wrote for Roy Orbison's widow. For the first five minutes of this discussion, I had no idea what he was talking about. But I was patient with Homer and I started asking pointed questions. Every time I got lost, I stopped him and clarified the point and we moved on. I pulled out a piece of paper and started taking notes. Homer has been a lifelong Roy Orbison fan. His greatest disappointment as a fan came on December 3, 1988. Homer had tickets to go see Roy Orbison when he was touring with the supergroup The Traveling Wilburys with George Harrison, Bob Dylan, Tom Petty, and Jeff Lynne. Homer had to watch the kids and he gave his tickets away. 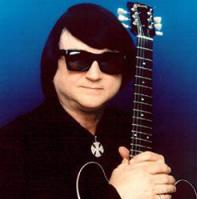 Three days later, Roy Orbison died. Homer never gave up being a fan of that haunting vibrato and Roy's soulful ballads. Homer couldn't help spilling a tear every time he heard "Cryin'" by the legend from Texas. On the 12th anniversary of his sobriety, November 24, 2009, Homer was inspired to write a song about Roy Orbison. He titled it, "Waiting." Homer was thinking that he'd send it to Roy's widow and see if she had any interest in it. The way Roy Orbison looked in Homer's dream. A month later, on his birthday, December 30th, Homer had a dream, a very spooky dream. In his dream, he found himself in total darkness. He kept looking around but he couldn't see anything. Then, he spotted a small light about a hundred yards away. He walked slowly toward the light. When he was about 20 yards away, he could make out a man with a guitar. As he got closer, he recognized this mysterious stranger as Roy Orbison. Roy was dressed in his traditional black outfit, shirt buttoned to the top. Maltese Cross around his neck. A guitar, propped vertically on his knee. Homer told me that Roy got the cross after his sons were killed in a fire. I didn't look it up and do a Snopes.com on him, I let that be part of his story. Standing face-to-face with Roy Orbison, Homer didn't know what to say. Suddenly, Roy spoke in a soft voice. "Son, you're doing a good job with that song. Write another." Homer thought, "That's enough... How dare I even ask Roy for anything?" But he did. "Mr. Orbison. Is there anything that I can do for you?" After a long pause, Orbison spoke, "Yes, there is. I want a statue of me built next to the school I attended in Wink, Texas, when I was growing up. I want my remains moved from Westwood Village Memorial Park Cemetery in Los Angeles to be under or next to the statue." Homer stood in total darkness. He couldn't see his hands in front of his face. Rapidly, he swung around, to see if there was anything he could focus on to get his bearings. Then, he spotted a small square in the distance. It looked like the outline of a door. Homer, walked toward it. It was a door. When he walked through the door, he woke up. It was 5 o'clock in the morning and he jumped out of bed. He scrambled around his house for paper and a pen, pencil, crayon, anything. He had to write another song. And he had the inspiration to do it. After a couple hours, he had finished, "On Bended Knee." Homer told me the two songs were symbolic of the undying love Orbison has for his widow. He was "Waiting", the first song. And he was waiting "On Bended Knee." Creepy. But I loved it. I told Homer I have a friend that leads a band called, "Rebels Without Applause." They've been a staple of the Cleveland bar band scene for 30 years. Maybe they might want to get involved with this? Homer wants to record the two songs and send them to Orbison's widow. He doesn't care what she does with them. Although, he is hoping that she might throw him a bone. He's living on food stamp and disability and he has COPD, so that coffee I bought him was like handing him $100. I'm not much better off, but poor people take care of poor people better than the well-to-do people around them. So, this story will have a sequel - The recording of Homer's songs. Who knows if it will ever happen. But I have Homer's phone numbers. Oh, I forgot. Early in our conversation, I told Homer I wanted to write about him on my blog. He said, "What's a blog?" I felt like a pioneer, showing him new discoveries as I explained what I do all day. He still didn't get it. But he really, really wants to record his songs. I was a bit disappointed at first that he wasn't Z. But as always, I got a great story. Who gets orders from Roy Orbison? Only the lonely that make the black outfits. What a Sunday. 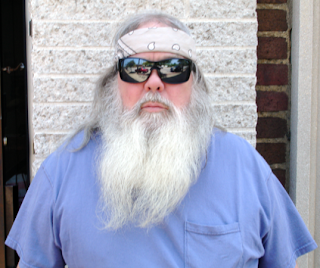 I thought I met half of ZZ Top and got the ghost of Roy Orbison. Amazing. Stay tuned. Maybe we'll get Homer's songs on iTunes and he can buy me a coffee. Poor people take care of each other.